Is it possible to get off thyroid medications or regain thyroid function without taking medications when you have Hashimoto’s? Most physicians and endocrinologists will say that in Hashimoto’s, hypothyroidism is irreversible and ends with complete thyroid cell damage, leading to a lifelong requirement of thyroid hormone medications. Physicians can perform thyroid ultrasounds to look for normalization of thyroid tissue as well as check for thyroid antibodies. If thyroid appearance on ultrasound normalizes and antibodies are in the remission range, a trial of slowly tapering thyroid medications may be attempted. Additionally, researchers report that a test can be done by administering TRH (Thyroid Releasing Hormone), which will cause an increase in T3 and T4 if the thyroid has recovered. While this test is the best tested to determine if the person can be weaned off thyroid medications safely, it is rarely used outside of research. I personally haven’t seen too many reports of these “spontaneous regenerations of thyroid tissue,” rather, I work with clients who take action to induce remission of their conditions, and in some cases, these clients also show a regeneration of thyroid tissue. In addition to the people I’ve worked with directly, I’ve corresponded with readers who have induced remissions and regenerations of their thyroid glands. Just to back up here, I want to state that weaning off thyroid hormones is never the first thing I recommend for people with Hashimoto’s. Rather, my first recommendation is often to optimize thyroid hormones by using thyroid medications! This is because your first plan of action should be to make yourself feel better. You are not going to feel better if you are thyroid hormone deficient. Optimized thyroid hormones play an important role in your body and will accelerate your healing. The fastest way to optimize your hormones is to take them externally, as a medication. I’ve written a great deal about optimizing medications, and my new book Hashimoto’s Protocol has an entire chapter on optimizing thyroid hormones that also addresses the latest innovations, old school remedies for tissue regeneration, and the common questions asked by readers! As you’re optimizing your hormones, it’s also important for you to adjust your lifestyle and address any imbalance in your body that has resulted from your condition and/or has led you to develop the conditions. This is where eliminating toxins like fluoride from your life, addressing your stress response, and improving your digestion and nutrition come into play. With these interventions, you will feel significantly better, and in many cases, you may be able to reduce or eliminate the attack on your thyroid. This can be measured objectively by your thyroid antibodies. You should see them reduced to under 100 kU/L. The lower the better, but under 100 kU/L seems to be a good number where there is more healing than damage happening. If the attack is not fully eliminated, you will also need to follow advanced protocols like clearing infections, toxins, and traumatic stress, until the autoimmune attack is fully addressed. Only then, when you no longer have thyroid antibodies, and your body is healing at a faster rate than it is destroying itself would I ever consider weaning off medications. At that point, you would gradually reduce the dose of medication UNDER PHYSICIAN’S SUPERVISION. Some people will present with hyperthyroidism as their bodies begin to heal and they begin to absorb more of their thyroid medications or begin to produce more of their own hormones as thyroid tissue regenerates. Seeing a person with palpitations and a suppressed TSH will encourage most physicians to lower the dose of thyroid medications. Thyroid medications should never be stopped abruptly, due to the complicated feedback mechanisms of our hormones. You want to give your body an opportunity to slowly get used to producing thyroid hormones thus, thyroid medications should be reduced very gradually under the supervision of a physician. A dose reduction of 25 mcg equivalent of levothyroxine every 4-6 weeks, supported by lab tests is the safest bet. Coming off thyroid hormones too early when you still have symptoms, triggers, and antibodies on board, and when your thyroid has not regenerated can be devastating and delay your healing. So now that you know the warnings, precautions, and order of operations, let’s go deeper into the factors that predict success in weaning off thyroid medications that I’ve observed. Some of the interventions that can help you successfully wean off thyroid hormones include getting off gluten, getting thyroid antibodies in the remission range (under 100 kU/L, but the lower the better), getting plenty of rest, using an infrared sauna, resting/physical relaxation that helps your body go from fight and flight to rest and digest, getting your nutrients (especially selenium, vitamin D and ferritin) in balance and eliminating of toxins/infections within the body/gland. My book, Hashimoto’s Protocol focuses on helping you to identify and remove your triggers, like gluten sensitivity or a nutrient deficiency, adjusting your nutrition to support your blood sugar and nutrient deficiencies, helping your body eliminate toxins, and reducing your stress response. However, even with all of your ducks in a row, not everyone will be able to reduce and eliminate the need for thyroid medications. Even in doing everything right, not everyone heals at the same rate. This is where interventions for accelerating thyroid tissue healing can really help!! Researchers in Brazil have been studying the effects of low level laser therapy on the thyroid gland in Hashimoto’s thyroiditis, and the results have been astonishing! Most significantly, they found that all patients who received the therapy were able to reduce their levothyroxine dose, while 47% were able to discontinue levothyroxine and have normal thyroid function during the 9-month follow-up. Additionally, LLLT can increase Transforming Growth Factor B (TGF-B), which is a cytokine that helps to induce and maintain the tolerance of self thus, also reduce thyroid autoimmunity. Lasers that emit LLLT are also known as “cold lasers.” and have shown to regenerate various tissues when the therapy is applied directly over an organ. This therapy is known as “photobiomodulation” and can be achieved using a laser or an LED device. LLLT can increase circulation in the thyroid gland and increase thyroid hormone levels in animals. While most body organs are not accessible to laser therapy, the thyroid gland is close enough to the skin surface so that the laser will be able to penetrate it. Additionally, this therapy is painless, non-invasive, and low-cost and carries a low risk as it does not use ionizing radiation! In their initial pilot study, researchers tested LLLT on 15 patients who had Hashimoto’s and were treated with levothyroxine. Patients received 10 applications of LLLT (830 nm, output power 50 mW) in continuous mode, twice per week for 5 weeks over the thyroid gland. Thirty days after the LLLT intervention, they began to see improvements on the thyroid ultrasounds. Thyroid antibody levels began to decrease within two months of the LLLT, and thyroid function began to improve and continued to improve until it reached a peak at 10 months post treatment. Thirty days after the LLLT treatment, medications were discontinued and then reintroduced, if needed. Researchers tested levels of thyroid hormones, TPOAb, and TgAb, at 1, 2, 3, 6, 9, months after stopping the levothyroxine. 47% of the patients were able to stop levothyroxine all together and maintain normal thyroid function. The rest were able to reduce their dose of medication. The average levothyroxine dose dropped from 96 +/- 22 mcg/day, to 38 +/- 23 mcg/day. Out of 15 people, 10 saw a reduction in thyroid antibodies, while two did not see a change, and three saw an increase. The mean TPO level reduced from 982 to 579 over the course of the study. The greatest improvement was from 2354 to 135. With respect to TG antibodies, 8 people saw a reduction, 5 people did not see a change, and 2 saw an increase. The mean TGAb dropped from 650 to 517, while the greatest reduction was from 966 to 35 in one person. Before the treatment, 20% had reduced thyroid volume, 27% increased volume and 53% normal volume. After the treatment, 43% of the people who had an abnormal thyroid volume saw that their thyroid size normalized. The remainder also saw an improvement towards normalization, reaching near normal values. Thus this therapy may also be helpful for reducing goiter size. This group also performed a randomized, larger placebo-controlled trial, of 43 patients in 2011.
and less infiltration of the thyroid gland on ultrasounds (meaning fewer inflammatory cells were present). Echogenicity index on thyroid ultrasound was improved in 95% of the study group, meaning that their thyroid gland had less damage and fewer white blood cells on ultrasound. At present moment, this therapy is still considered experimental and only performed at the Thyroid Outpatient Clinic of the Endocrinology and Metabolism Department at the Hospital das Clínicas, Faculdade de Medicina da Universidade de Sao Paulo in Brazil. The therapy is not FDA approved, however, individual doctors may be able to utilize this therapy with their patients as an “off-label” use. The researchers noted that the effects of the therapy may not last forever; a person may need to go in for “maintenance” on an annual basis. However, when used along with the Root Cause Approach of removing triggers, this therapy can potentially result in a functional cure of Hashimoto’s for additional people. Please note, this therapy has not been tested on people who take immunosuppressants like corticosteroids, in those with thyroid nodules, nor in those with hypothyroidism from postpartum thyroiditis or Graves disease. I have been working with laser companies, clinicians, and research institutions to attempt to facilitate the introduction of this therapy into the United States and Europe. I even thought about starting my own medical device company [until I found out that I would need a billion dollars to do so, lol- if you know any billionaires, send them my way :-)]. While we’re making progress, the process has been slow and challenging. 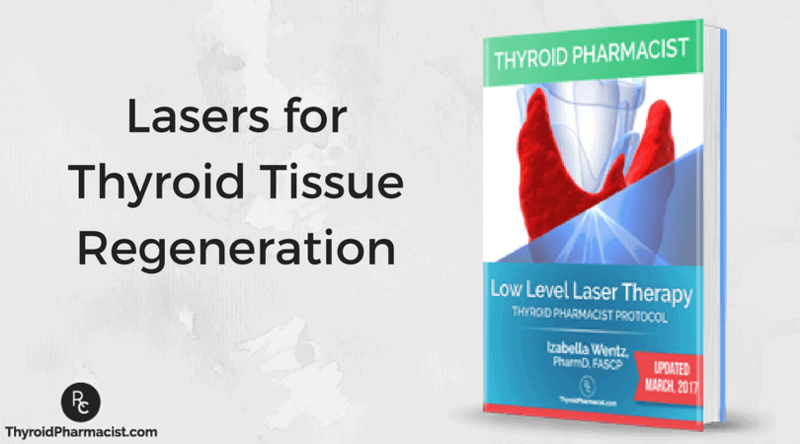 PS – I share more strategies for regenerating thyroid tissue in Hashimoto’s Protocol. PPS – If you are a clinician that is offering this therapy, please let me know, as I am starting a database 🙂 If you’re not yet offering this therapy, let this be a call to action for you to start offering it! de Freitas, Lucas Freitas, and Michael R Hamblin. “Proposed Mechanisms Of Photobiomodulation Or Low-Level Light Therapy”. IEEE Journal of Selected Topics in Quantum Electronics 22.3 (2016): 348-364. Web. John – thank you for following this page. I appreciate your interest my work and wishing to be a part of the recommended practitioner list. Hello Dr. Wentz. I just got your new book the Hashimoto’s protocol. Love it! I have a couple of questions: Have you seen anybody heal from Hashimoto’s without thyroid supplementation. I have had Hashimoto’s for 10 years diagnosed and only took naturethoid very small dose for 9 months but I honestly felt worst on it, as I go from hypo to hyper, so have not taken thyroid supplements for 10 years and my Antibodies are even lower now than 10 years ago. Granted I follow a better diet now too. Will cold laser therapy work if I have nodules? And if I start thyroid supplementation being quite sensitive to several foods what thyroid medicine do you recommend? I am not sure if to use Armor this time last time I used Naturethoid from compounded pharmacy. I have been following you for several years now; officially for 2. I got your book The Root Cause, several years ago and it’s tabbed and doggy-eared from use. I now have your Secrets books and DVDs, cookbook and the latest book just published (whose name escapes me at the moment). My comment on this article is that I am currently going through LLLT for my hair regrowth and recently while under the “hood”, I was thinking, “could this possibly help my thyroid?” You answered my question, albeit the LLLT is probably as different strength that what I am using now. I believe I have done all I can with this. Diet change, supplements, vitamins, etc. I go to a Functional Medicine Doctor as well as my current MD. I do believe I can get this straightened even if it’s just a remission. I have Faith and I thank you, for all the hard work you have put in over the years even using your own body as a test subject. You’re a God-send to us suffering from this disease. Thank you so much and God bless you and all your efforts to help those of us affected. Theresa – Thank you so much for your support! <3 Keep, up the great job, and I’m looking forward to hearing your progress on this page. This is interesting. How does all this information apply to someone with simple hypothyroidism, not Hashimoto’s? I don’t have those antibodies. Is it still possible to wean off of thyroid meds? Debra – thank you so much for following this page. I researched the use of LLLT last year and also thought it looked promising. It’s nice that others have discovered it may prove useful in the battle against Hashimoto’s thyroiditis. I am currently trying a red LED light/infrared light from RedLightMan in England, who lists thyroid issues as something that could possibly be addressed using LED light. I’ve been a fan of red LED light for years. I also read the Facebook LLLT page and the Photobiomodulation page. I need to go on the Hashimoto’s 911 page and see if anyone there has tried laser or LED therapy on their thyroid. Thank you so much for writing this article. I will be posting it on the two Facebook pages, as well as enlightening (ha) my nurse practitioner and Nucca chiropractor. I hope you will be writing more about this in the future. I love your books. Elizabeth – thank you for following this page and for the feedback. I’m looking forward to hearing your progress on this page. Elizabeth Cameron hope you visit this page again and give us an update. I had a hair mineral test done and it showed that I lack selenium and iodine. they are below range. I have hashimoto. I took selenium but not all the time, now I do it everyday with zink for 4 months. Can I take small amount of iodine ? I notice when I take it my brow hair grow back and I loose less hair from my head. especially when hair mineral test showed a lack of it. Zoya – I’m very hesitant in recommending iodine in Hashimoto’s. Although iodine serves as fuel for our thyroid and is very important in iodine deficiency hypothyroidism, Hashimoto’s is a different mechanism. It’s like pouring gas into an engine that’s on fire… that’s essentially what’s happening in Hashi’s, thyroid inflammation, and adding iodine to the mix before putting out the fire and fixing the engine may result in further damage to the thyroid. In those with a predisposition to autoimmunity, this has been documented time and time again, animal and human studies. I have spent 4 years researching this and have seen too many people suffering the consequences of adding iodine too soon. My approach is, let’s fix the engine first (usually a gut issue), and then add the fuel once we know that the engine is no longer on fire. Hope that you will check out my book. I have an entire chapter on the iodine controversy that references numerous studies as well as the work of Abraham and Brownstein. Dr Michael Hamblin at Harvard states that there is no difference between red/infrared light from a laser vs from LED lights. Are you sure only a laser is effective? I love your work (I feel like I can relate to you–I was diagnosed as a young married woman in my 20s and was healthy before), and no matter what I believe I will heal my hashi’s! If you were in my shoes, who would you go for to get lazer therapy? I am recently diagnosed. My antibodies are pretty high but lost 30 pounds! Eating like you say to! Emily – thank you for following this page and for your support. 🙂 I cannot tell you specifically what you can and cannot do over the internet as I could be held liable for what would happen to you. Thank you for all of your research and information regarding Hashimoto’s. Years ago there was nothing available now the internet is rampit with information. One question I have is why is it not beneficial for Hashimoto’s patients to eat a vegetarian diet? I don’t recall seeing an article from you regarding this so was just curious. Will be looking into the cold light therapy. Is the red light therapy beds at the tanning salons the same thing?? Tara – thank you for following this page and for your support. Hi Izabella, just received your book, thank you. Haven’t read it yet but went straight to the most needed information for me. In the triggers defining part you list hep C and hep C treatment separately. What did you mean by that? I am about to start HepC treatment with ZEPATIER medication but am very concerned with side effects, being Hashimoto. What is your view on this matter, please? Warm regards for your dedication.O. Oskana – thank you for following this page and for your support. Please, understand that due to liability issues, I am unable to answer specific medical questions. I have hashimotos and nodules, but am not currently on medication. So this is or is not helpful for reducing nodules? I would love to reduce them as they keep growing. :(. Thanks! Christine – thank you for following this page. I highly recommend that you work with a functional medicine clinician. It’s a whole medical specialty dedicated to finding and treating underlying causes and prevention of serious chronic disease rather than disease symptoms. James – this is very encouaring to hear! Please keep us updated on your progress and good luck on your health journey! James, congrats on the great results! Did the laser light shrink your nodules? I’m thinking of trying it on my nodules even though it’s not been studied on those with nodules. HI James, where did you buy the laser from? I am one of the 10-20% that has normal TPO and TG antibodies, but thanks to your book, I urged my doctor to check my thyroid with ultrasound, and the damage was clear, and my diagnosis of Hashimoto’s was made. I am following your protocol (I’m in week 2 of the the liver protocol), and I started taking the suggested supplements, including selenium and NAC. I found a provider that will do the LLLT, but I’m wondering if I should stop taking these supplements before I start the LLLT. If so, should I stay off of them for the 5 week LLLT process? Your books have helped me find the reasons why my health was so poor, and I’m excited to get on the road to remission! Thank you. Can you please tell me where could I find in the European Union, appropriate devices for LLLT ? Ionela – Laser therapy is a process that needs to be performed under the supervision of a licensed practitioner. I highly recommend that you work with a functional medicine clinician. It’s a whole medical specialty dedicated to finding and treating underlying causes and prevention of serious chronic disease rather than disease symptoms. Ionela – You are very welcome! I hope you find a great practitioner to help you! Dr Wentz, my friend, 53 yo, has just been diagnosed with hyperthyroidism or Graves disease and she has been all her adult life with PCOS disease. We are assuming that this is been one cause that’s led her to Graves but she hasn’t talked to the doctor yet. I am curious if the LLLT light therapy would help her and she is not on any meds currently for her thyroid symptoms. I know she does not want to remove or radiate her thyroid so I can only assume that she may go on that medication that would depress the thyroid production. Is there a protocol to follow that can help her thyroid go back to normal production and get off the medication if that’s what they give her? Her daughters, one has lymphedema in her legs and the other has Scleroderma terminal but she has been in remission for 12 years under the care of an MD Chinese medicine doctor. She was diagnosed at 16 and given no hope by the main stream Medical doctor. She is now 30 years old and occupational therapist and getting married this next month. So there is hope for even the darkest diseases. Anyway, we would like to know if near infrared therapy would be good for hyperthyroidism. Karen – thank you for following this page and sharing that! Graves and Hashimoto’s are both autoimmune conditions that affect the thyroid. They are thought to be closely related. Sometimes one turns into the other. The difference is the site of the antibody attack. In Hashimoto’s, the antibodies are found to thyroglobulin (in 80%) and thyroid peroxidase (TPO) enzyme (in 95% of people) – Hashimoto’s results in hypothyroidism and is usually treated with Synthroid and replacement hormone. Any more info for patients with nodules? Thanks! Melissa – Thyroid nodules are often the result of antibodies that attack the thyroid in Hashimoto’s. In this case, it can affect thyroid function because these antibodies are basically destroying the thyroid gland. This is something that should be followed up on and monitored to make sure that the nodules are not growing or increasing in number as this can be indicative of increased antibodies and destruction. Thank you for this information! Would you be able to say if lasers can help nodules specifically? Thanks! Thank you for being the advocate on illness that so many of us are struggling with! You are a wonderful resource! Your books are eye-opening and amazing! I have had Hashimoto’s since I was a child probably. Didn’t know I had gluten intolerance, and back home in the Balkans bread and pasta is the main staple, and so I was starting to develop somewhat of a goiter. Out of concern, my mother took me to the endocrinologist some 20 years ago when I was only a teenager. Upon receiving the liquid, iodine (guessing it was radiated iodine), little did I know combined with Hashimoto’s I am having to take synthetic hormone for the rest of my life (this was the standard procedure back than in former Yugoslavia it seems). While I have been successful in lowering TPO from 360 to only 52 over the years with diet and supplements, I am wondering whether this promising laser therapy could be of any use for someone like me? Radiative iodine (if that is what I got) renders the thyroid gland completely non-functioning? Is such case equivalent as hot having a thyroid gland at all? And also, I am very curious, is there a way to test whether my thyroid would be able to absorb Iodine at all? I just don’t know how much damage the radiated iodine has had on my thyroid, since i can’t remember how much i had from it, it was very long time ago. Sabina – The best way to know the current state of your thyroid gland is to have an ultrasound. I highly recommend that you work with a functional medicine clinician who has experience with ultrasounds and lasers. It’s an entire medical specialty dedicated to finding and treating underlying causes and prevention of serious chronic disease rather than disease symptoms. I’m very interested in LLLT for treating my hypothyroidism as I’ve had issues with dosing and optimizing thyroid medication for years and would love a non-drug treatment. One concern I have though is that LLLT might cause cancerous lesions that might be in the thyroid to grow, and I’m wondering if it would be advisable to have some sort of screening for thyroid cancer before undertaking this therapy. I haven’t seen this mentioned by anyone recommending LLLT, but I have seen at least one study (in mice… https://www.ncbi.nlm.nih.gov/pubmed/27078192) showing that LLLT promoted tumor growth. So now I’m wondering if this is a valid concern and would love to hear your thoughts on this. First, I wanted to thank you for all your efforts in promoting the treatments nad giving hope to all Hashimoto patients (and their parents). I have a 12 yo daughter with Hashimoto and according to the ultrasound her thyroid tissue is almost gone. So needless to say I am very interested in LLLT. I started searching the internet and found out that there have been dozens of studies done in Rissia and Ukraine regarding LLLT for Hashimoto patients with 86-96% success rates. Studies go all the way back to 1990s and include both animal and human clinical trials. Various LLLT protocols are patented and recommended as a “treatment of choice” for Hashimoto and hypothyrodism. Most of the information is in either Russian or Ukranian, but I do speak Russian so it was not a problem for me to read it. The devices they use are manufactured in Russia. In the studies they do not recommend this treatment for thyroid cancer patients or for patients with thyroid nodules (these have not been tested as far as I could find). But other than that there was 0 side effects reported. It is very sad that a highly successful treatment that has been used in other countries for decades is just barely finding its way to US. Most alarming is that conventional endos look at me as if I have two heads when I mention it and STRONGLY advice against it without having any info as to why not. I will definitely contact the doctor in West Covina you mentioned in your book and hope I will see positive results with my daughter. Fortunately he is not that far away from me. But please keep promoting the LLLT. It obviously has a huge potential and hopefully one day it will become an integral part of the hypothyrodism treatment in US as it is in other parts of the world. Yana – Thank you so much for your support. My heart goes out to you and your daughter, and I look forward to hearing your progress on this page. First of all I want to thank Dr. Izabella sincerely for all your her efforts for people who suffer from thyroid issues. I had a phone conversation with a foreign doctor who uses several methods in treatment of thyroid and one of them is LASER. After speaking with him I found this website. I am open to go visit the foreign doctor I found, but obviously I would much rather visit one here in the US – preferably NY or NJ area. Dr. Izabella can you please share information about such doctor? If this is something that cannot be posted here – please email me. If there is absolutely nobody in the US can I please have a referral to Brazil University? I will keep you updated on the progress and will share as much from my experience as possible to help others. Mike – thank you for following this page and for your support. I have been using LLLT for autoimmune thyroiditis for a few months with amazing results. Just wanted your opinion for use in a non-toxic, euthyroid goitre to help shrink goitre size? Leah – Thank you for following this page. Please, understand that due to liability issues, I am unable to answer specific medical questions, but I highly recommend that you work with a functional medicine clinician. It’s an entire medical specialty dedicated to finding and treating underlying causes and prevention of serious chronic disease rather than disease symptoms. Where can I find a list of pracctioners that use low level light therapy or good LLL devices that I can use? I’ve just ordered your most recent book, Hashimoto’s Protocol and look forward to having a good read and potentially some positive life changes. Would there be any benefit in ordering your other book, Root Cause? I know it maybe tempting to say yes as it means more sales, but is there much overlap with the new one? David – thank you for asking! The Root Cause Book was my tracking of the experiments I did on myself to recover and regain my health. The Hashimoto’s Protocol book is a more step by step guide of the interventions that helped 80% of the people 80% of the time. I hope you can check them out. Just to let you know, someone in London is helping me with this. I am wondering if there is any other supplements I should quit like B12 during treatment? Hello. I am from Trinidad W.I. (in the caribbean) I am interested in trying the laser therapy to help with my hypothyroidism and hashimoto. Can u recommend a doctor who works with these type of patients please. Thank you. Is there any hope for a Graves patient who had radioactive iodine treatment to regain thyroid function and getting rid of Synthyroid? I know my thyroid was not totally destroyed by RAI, because lab test 6 months after RAI showed some thyroid function, just not enough so I need Synthyroid. I had RAI 10 years ago. The weird thing is that I have had two 6 months periods after RAI of being able to go without Synthyroid – and my hormone levels were normal at those times! My doctor could not explain why this happened. I have not heard of anyone else having this kind of on-off thyroid recovery post-RAI. Is there hope for me? Can I try LLLT? Mariah – thank you for reaching out. Graves and Hashimoto’s are both autoimmune conditions that affect the thyroid. They are thought to be closely related. Sometimes one turns into the other. The difference is the site of the antibody attack. In Hashimoto’s, the antibodies are found to thyroglobulin (in 80%) and thyroid peroxidase (TPO) enzyme (in 95% of people)-Hashimoto’s results in hypothyroidism and is usually treated with Synthroid and replacement hormone. HELP! – I decided to try RLT 20 mins (2/Days) I have Hashimoto’s and have gained almost 3/lbs??? Renee – I wish I could give you more direct advice but, each person will react differently. I would advise you to ask your personal pharmacist or a trusted clinician who’s care you are under. I am not able to respond directly to these types of questions here. I have taken three detoxes lately which have lowered my Synthroid dose from 150 to a mix of 112/125s. I was on nature-throid, but my functional medicine guy took me off of it because one of my numbers was off and he also put me on cytomel much to my naturopath’s dismay. Anyway, I am writing to let your readers know that every time that I go to the infrared sauna, my dose changes. For example, I will go back to the infrared spa in a couple weeks and I will end up taking one less of the higher dose and one more of the lower dose after every visit. It’s amazing. Unfortunately, infrared sauna spas are difficult to come by. This one is in Westchester, NY. Hello, after reading your article, I showed it to my Chiro who has an Omega laser, he set me up twice a week as the studies here did. Granted, I also started NDT but I have been on NDT before and got my TSH to a high normal level, never optimal. This time 11/17/17 my TSH was 68. 2/5/18 after 5 weeks of two times a week laser and NDT my TSH is 0.07! I’m cutting back in the NDT! Thank you for sharing this information! Thank you for this information! I showed your article to my chiro who has an Omega XP LLLT Laser. He allowed me to use his laser, I used the 46 diode probe for 2.5 min on each side of my thyroid 2 twice a week for 5 weeks. I should also say I started taking 120mg of NDT (60 mg am and 60mg at noon). My TSH was 68 in Novemeber (low T4 and T3 as well) rechecked 2/5/18 TSH is 0.07 (high T3 and T4, normals RT3). I’m sleeping better, no more constipation and occassional heart palpitations! I have made a lot of diet and lifestyle changes too. What does it mean by “continuous mode” in the study methods? The laser is going nonstop for a long period of time? I’m looking into finding red light therapy in Dallas, TX and all I can find is a dermatologist who uses it for acne and rosacea. Even though it’s the same wavelength I assume it wouldn’t have the same effect because it’s just on the face? Here’s an odd question. I wasn’t sure where to post this, but this article seemed most appropriate. I have been reading about brain waves and training your brain to change brainwaves, such as in meditation, from perhaps Beta to Alpha. I was just wondering if there is any research as far as healing autoimmunity with this? I have a difficult time meditating for my Hashimoto’s but find that certain relaxation music or binaural beats helps. I also have read that the Greeks used light through a spinning wheel to induce certain states of mind and thus alter brain waves. I know that with my Hashimoto’s, doing that would immediately trigger a migraine. Just wondered if there would be a way to harness brain waves for Hashimoto’s? Jane – thank you for reaching out. Meditation can be a particularly powerful tool for improving thyroid health, as studies have shown that it has the ability to boost levels of key hormones and neurotransmitters, including serotonin, the calming neurotransmitter GABA, the adrenal hormone DHEA, growth hormone, and melatonin. Research has also shown that meditation can help your adrenal glands. I’ve found that an inability to manage stress is often at the core of the condition. Most people can trace back the development of Hashimoto’s and autoimmune conditions to a particularly stressful time period. Stress is inherent, and it’s how we handle our stress that matters. I recommend self-management stress-reducing habits like mindfulness, yoga, and meditation. Meditation has specifically been found to be helpful in building resilience to stress. If you have a history of childhood trauma like I do, your stress response could be severely impacted, leading you to overreact and get into a ‘fight or flight’ state at the easiest provocations. I recommend therapies like the self-guided tapping, self-help books, neurofeedback or therapist guided EMDR to reset your stress response. Here are some resources I hope you find helpful.